If high winds and driving rain have left your roof in bad shape, call the professionals you can trust! Our roofing company has been in the business for years, and we’ve seen everything a storm could possibly throw at us. Water and hail damage are common after thunderstorms and tornadoes, and high winds can blow tree limbs and debris across your roof, causing even more harm. If your roof has suffered wind, water, or hail damage in Grain Valley and Kansas City, MO or the surrounding areas, call us today.816-228-1158 We can help with your insurance claim, and get the work done from start to finish! If storms have recently blown through your area, you should get a thorough inspection of your roof. Climbing up onto a roof, especially if it’s still wet and slippery, can be dangerous, so we recommend hiring a professional to do the inspection. They will know which signs to look for, including damage that might not be apparent from ground level, or even during a casual inspection. 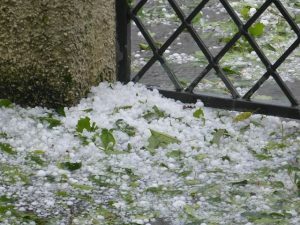 Hail Damage – Hail can be very damaging to any type of roof, but asphalt shingle roofs can really take a beating from the stony ice. It can punch through shingles, knock them off, or leave your roof with indentations all over. If you notice any of these signs, or if it hailed recently, call us as soon as possible! Rain Damage – Heavy or consistent rain can pose a risk to your roof. Signs of water damage include discoloration, sagging, or warped shingles. If unaddressed, this water damage can move down into the deeper layers of the roof, requiring costlier repairs down the road. 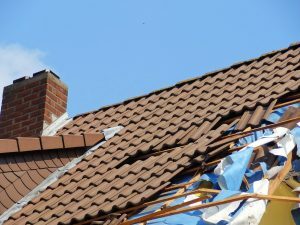 Wind Damage – Wind poses two major threats to residential roofs: it can blow off the shingles directly if gusts get strong enough, or it can pick up debris, like tree limbs, and hurl it into your roof. Holes in your roof, missing shingles, or indoor leaks are all signs that your roof needs repair. Updated on September 21, 2018 at 7:10 pm by United Roofing Services.